The opening of Liam Pieper’s The Toymaker is fairly confronting. Adam Kulakov, a successful middle aged man is thinking of ending his affair (not his first) with a sixteen-year-old school girl. This is just the start of Adam’s problems, problems that are juxtaposed against the struggles of his wife Tess to keep their family business afloat and the traumatic history of his grandfather, transported to Auschwitz during World War 2. The Toymaker has some finely observed, if not always particularly likeable, characters. Adam Kulakov is the epitome of the privileged Australian male. Second generation, living high on the money generated by a company started and grown by his grandfather, arrogant and entitled. Adam’s problems, which become his family’s problems, are grounded in his own hubris and stupidity, in his belief that he is somehow better than those around him. His wife Tess has come from a different direction – her family fortune squandered, and finding herself in a loveless marriage she finds meaning in the company and her connection with Adam’s grandfather. All this is held against the struggle of Arkady Kulakov, a young man transported to Auschwitz and blackmailed into working on medical experiments, finding some meaning by bringing comfort to children slated for death by making them toys. The Toymaker is a novel about secrets. The three main characters all keep secrets about themselves, to varying degrees of success from each other. As Adam’s world unravels, it is these secrets and their revelations, to the reader if not other characters, that drive the plot forward. Pieper handles this aspect expertly, carefully dropping hints along the way so that major revelations and twists come as a shock but not, on reflection, a surprise. Pieper tackles some big issues in the The Toymaker. From the experimentation on children in Auschwitz to the exploitation of women and children to fuel modern capitalism. From exploring how people justified what they do during war in order to survive through to the entitlement culture of modern Australia and justifications of a completely different sort. 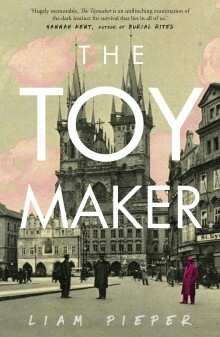 The Toymaker is a confronting, original and engaging – a deep, often disturbing look at the dark heart of the modern world.